After satisfying a reasonable professional experience requirement, most candidates can expect to complete their CRI Charter or CRI Associate within 12 – 24 months. The self-directed nature of the CRI Program, and the ability to customize your exam dates at any one of the 12,500 nationwide H&R Block locations, brings a level of flexibility that other programs do not match. Other designations are typically earned over a longer portion of one’s career. For example, the CMB and CCIM require several multi-day core courses taught in a “classroom” setting, in addition to electives and/or other experiences. As a result, working professionals pursuing these designations may invest several years accumulating the credit or points that will ultimately count towards their designations. Consider the following comparison of your potential time investment to earn the CRI Certification versus other designations. (1) The CRI Charter is earned when a candidate, who possesses a minimum three years of qualified real estate experience, successfully passes both the Associate and Charter examinations. Depending on a candidate’s level of professional experience, most candidates can expect to earn their Charter or Associate within a 12 – 24 month period. The self-directed nature of the CRI Program allows the candidate to prepare and sit for exams on their own schedule. (2) The CMB designation is earned when a Candidate, who possesses a minimum five years of mortgage industry experience, earns over 150 CMB points and then passes a written exam. 35 – 75 of CMB points can be earned through School of Mortgage Banking, which offers customary training and continuing education courses in “classroom” settings throughout the United States. Additional points can be earned through professional experience and industry participation. Mortgage industry professionals typically accrue points throughout their career before officially pursuing their CMB designation. (3) The CFA® Charter is earned when a candidate, who possesses a minimum four years of acceptable professional work experience, successfully completes all three levels of the CFA® Program. The Level I exam is offered twice a year but Levels II & III are offered only once annually. As a result, the minimum time required to earn the CFA® Charter is 2 ½ years but failure of any one exam will result in a longer experience. 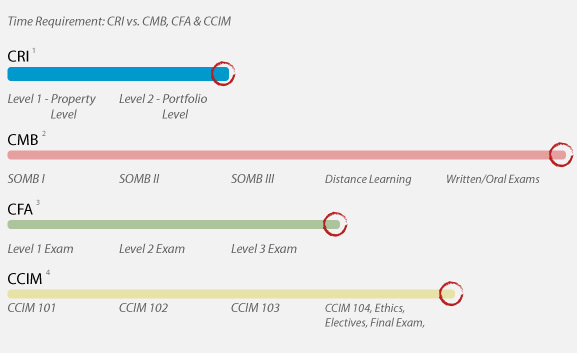 (4) The CCIM designation is earned when a Candidate, who submits a satisfactory Portfolio of Qualifying Experience (a volume based transaction history), completes four core CCIM courses, an Ethics course, various elective courses, and finally completes a comprehensive exam offered twice per year. The four core courses are offered in “classroom” settings throughout the United States and are five days in duration. Other CCIM required courses can be completed in this setting, or online.